Each month, more than 115,000 people who are passionate about their horses view more than 320,000 pages on HorseCity.com, reflecting the deep commitment and dedication to a way of life that involves horses. 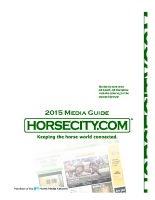 HorseCity.com offers advertisers a technology that is cutting edge for showcasing their product through banner advertising, video, and custom email pushes. Our clients have included Purina, John Deere, Fort Dodge, Ford, Sundowner, Craig Cameron, Chris Cox, Pat Parelli, Clinton Anderson, Extreme Cowboy TV, Dover Saddlery, Smith Brothers, Teskeys and more than 900 others. HorseCity.com brought a full complement to Morris’ impressive equestrian lineup when it officially went online in 1997. HorseCity.com offers more in-depth horse news and information than any other equine website and has been awarded acclaim by Forbes and the American Horse Publications. Fully featured web publishing site with over 750,000 YouTube video views.